An intense match up between #1 U-32 and #2 Lyndon Institute last Thursday night created a focused locker room scene. The Raiders started off their typical pre-game routine as players went around sharing their goals for the game. “We need to come out strong and be ready to go. We need to watch their outside shooters and continue playing good defense”, said Senior Captain, Lilly Richardson. Every game the girls have a “players’ prayer”. It is a superstition they have, because whenever it is read by Senior Krista Towne, the outcome of the game will be a win. “When all eyes are upon me at the end of this game, I will turn their eyes to you, Oh Lord, and to the glory of your name.” This created a focus in every player as they returned to their seats in the locker room, which remain the same every game. 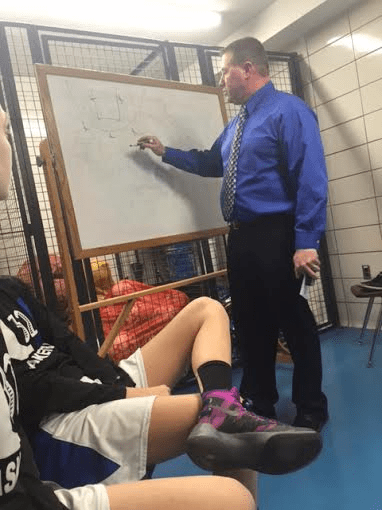 Those are the last words spoken by the girls before Head Coach Travis Paquet gave his pre-game speech. “It is a big game. It’s a number 1 against a number 2”, Paquet said. “When we go out there we need to be ready to play basketball. We need to come out with energy.” With that, the Raiders had their final cheer. After a long fought battle between both teams, the Raiders ultimately squeezed by with a two point victory, 46-44. “You all played hard, you dug deep and you all did what I asked you to do at the beginning of the game which was to not give up”, said Paquet after the game. 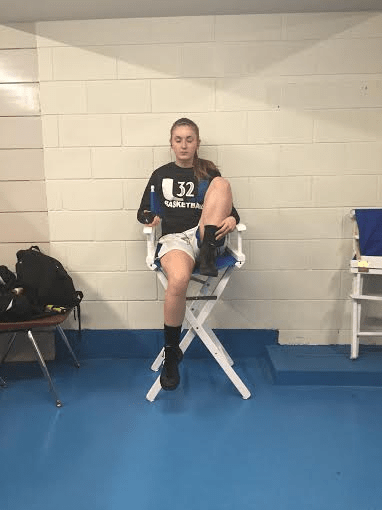 Asked what the favorite moments of the game were, Krista Towne said, “It was the buzzer beater at the end of the third that got everyone pumped.” It was a momentum changer as the Raiders gained a seven point lead. Though the game was close, players thought it was a good thing. “It brought up our intensity and our energy because everyone was into it”, said Junior Katie Morissette. “What got us back into the game was our press, we added more pressure and we created turnovers”, said Morissette. It was nothing but excitement and smiles in the locker room for the girls, as many of them continued to “woohoo” long after the game. Staying focused before the game set the tone for the Raiders, and the craziness in the locker room in the end was the perfect end to a great win.